A student records his French homework directly into GoAnimate for Schools. To answer the question of how to motivate intermediate French immersion school students to speak French in and out of the classroom, to step outside of the academic French and into the casual, conversational arena, it is necessary to consider their interests beyond the classroom. In this age of electronic resources, entertainment, games, education and employment, is it any wonder that students can be motivated through the use of electronics in the classroom? Once introduced to the application, the students dove in with an incredible ability to decode all the options and adeptly maneuver through the vast possibility of character, scenes, props and actions. Within 30 minutes, they knew more about the program than I had after two hours. The difficulty at this point was not engaging them but in keeping them on the specific task rather than the creative cycle of character creation. Given the limited number of computer lab hours in the week, I was not able to devote too much time to the actual video creation. At least half of the process was spent researching, writing and refining the video script. The students were given the option to create their characters at home, which a good number of them decided to do. 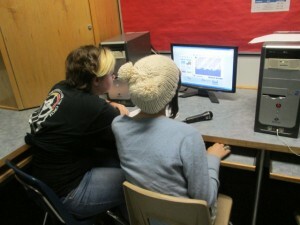 The vast majority also looked for outside class time to work on the video more as we neared the deadline for completion. The application provides a vast number of options to modify the video, which gave the students serious motivation, personal investment, and creative control as well as enabling them to produce very unique, personalized videos. Another fabulous feature was the ability to add the students’ own audio to the characters and change the vocal tone, which inevitably had students not only just speaking French, but also playing with the language, laughing at themselves and each other and really immersing themselves in the project. Another option to make a short video as opposed to a movie would enable teachers to undertake a shorter project, when necessary. While not allowing for as much creative control, this would be a great option for the younger classes or a good beginning step to introduce the program without all the (sometimes distracting) options the first time around. Ultimately, the project was a fantastic, well-received, motivating, engaging task that helped me realize my goal to encourage French language conversation outside the classroom while engaging students in French conversation and research inside the classroom.